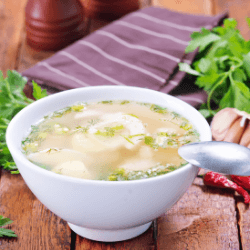 This chicken stock is packed full of flavor that you can eat by itself or make into many other delicious dishes! This is a healthy meal that will stick with you and taste great. Remove the organs from inside the bird, (the neck will go in the stock pot). Remove as much skin as possible, not worrying about the wings (this is the hardest skin to remove). Place chicken or chicken pieces in a large stainless steel pot with filtered water, vinegar and all vegetables except parsley. Let stand 30-60 minutes. Bring to a boil, and remove scum that rises to the top. reduce heat, cover and simmer for 40 minutes if using a whole bird. If you are using bones reserved from a previously roasted bird simmer for 2 to 6 hours. The longer you cook the stock, the richer and more flavorful it will be. About 10 minutes before finishing the stock, turn off heat and add parsley. This will impart additional mineral ions to the broth. Once stock has slightly cooled add the juice of half a lemon. This will alkalize the acidity of the broth helping to also balance the flavor. Allow stock to cool to room temperature before storing, especially if storing in plastic bags or containers. Strain the stock through a sleeve or a colander into a large bowl or vessel and reserve in your refrigerator until the fat rises to the top and congeals. Skim off this fat and reserve the stock in covered containers in your refrigerator or freezer. Note: if you are using a whole chicken, remove the chicken after 40 minutes of active simmering over medium heat. Let cool and remove chicken meat from the carcass. Reserve this meat for other uses, such as chicken salads. Return bones to the broth and continue cooking 2-6 hours as per instructions above.